Wendy McGrady has more than 30 years of development and marketing experience, many of them for nonprofit and philanthropic organizations. Much of Wendy’s work takes place behind the scenes working directly with clients, but she has also become a sought-after presenter and speaker on the topic of enhancing nonprofit development capacity and other fundraising issues. She has served on the faculty of Tidewater Community College’s Academy for Nonprofit Excellence, University of Richmond’s Institute on Philanthropy, and has spoken at the Hudson Institute, as well as Association of Fundraising Professionals chapters across the region. 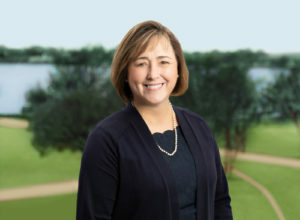 As executive vice president at The Curtis Group, Wendy works diligently with her clients to determine the unique strategic direction for every campaign. She oversees marketing for the firm and she conducts board trainings and retreats. Her three decades of experience include donor and volunteer leadership cultivation, major gift solicitation strategy, and coaching of senior staff. Her marketing background enables her to offer clients unique insight into brand development, public relations and effective communication of their efforts. Immediately prior to joining The Curtis Group, Wendy was chief development officer for Tidewater Community College in southeastern Virginia. She is a past president of the Hampton Roads chapter of the Association of Fundraising Professionals, and currently co-chairs the Giving USA Editorial Review Board—which offers valuable input to Giving USA each year. She co-chaired the 2011 Virginia Fund Raising Institute. Wendy is a Phi Beta Kappa graduate of Hollins University. She has served on the University’s Alumnae Board and is a past president of the Hampton Roads Chapter. Wendy served as vestryperson and senior warden at Christ and St. Luke’s Episcopal Church in Norfolk, Virginia, as board member and board president of ForKids, Inc., also in Norfolk, and currently serves on the board of the Elizabeth River Project. She is a graduate of the Hampton Roads Chamber of Commerce’s LEAD Hampton Roads. Wendy was selected by Inside Business in 2001 as a top “40 Under 40” honoree, and in 2006 as a recipient of the Women in Business Achievement Award. When she’s not working, Wendy loves watching her twin sons participate in sports, as well as sharing with them her passion for traveling and the outdoors.